In honor of the movie and one of my favorite authors and books, I will be reviewing A Wrinkle in Time by Madeleine L’Engle. Madeleine L’Engle was one of the first authors to write science fiction for children, which other authors discouraged because they believed children wouldn’t understand it. I did judge the book by its cover because the cover had three children riding a centaur with a rainbow in the sky. My brother read the beginning of the book to me and then I finished it on my own. I loved it so much that I read the next two and I loved those so much that I kept buying her books and reading them. 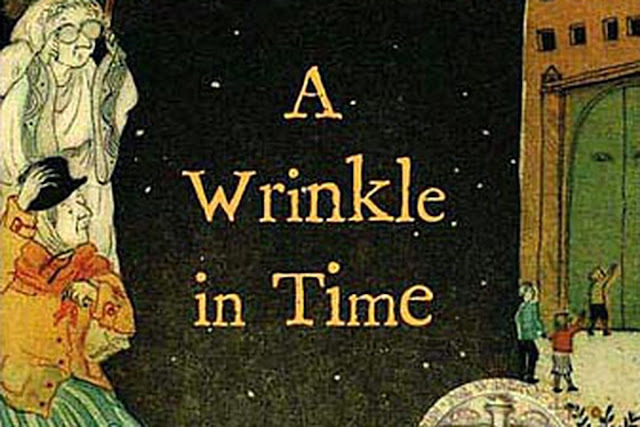 There are five books in the Time Quintet: A Wrinkle in Time, A Wind in The Door, A Swiftly Tilting Planet, Many Waters, and An Acceptable Time. A Wrinkle in Time is about a girl named Meg who awakens on “A dark and stormy night” to find her brother Charles Wallace making cocoa and a mysterious person who has come in from the rain. This person is Mrs. Which who tells Meg and Charles Wallace that their father is in danger. He went missing while researching a tesseract, or a wrinkle in time. Meg, Charles Wallace, and their friend Calvin venture through space with Mrs. Which, Mrs. Who, and Mrs. Whatsit to get their father back. They meet the Happy Medium who tells them where their father is, and they hurry to the standardized and controlled planet. IT is controlling the planet and Charles Wallace does mind-mind combat with IT. Their father is rescued and they go home and most likely have a sandwich. I know, that was a rather rushed summary but the major plot points are there. I love how Madeleine L’Engle made such a beautiful story of these kids going on an adventure and travelling through space and included science and weird characters and made it interesting and understandable. For once the main character was an actually nerdy girl who’s good at math. Mrs. Who only speaks in quotes, sometimes in different languages that a kid wouldn’t understand, but it adds to the mystique of the three women that guide Meg, Charles Wallace, and Calvin. There are so many wonderful quotes from this book. The book comes across as mysterious and hard to understand but it really is easy for a kid to understand. What I find interesting in this book is how naturally poetic the dialogue is. When reading it, the dialogue sounds normal, but if you imagine yourself saying that dialogue on its own you realize you would sound really strange. I think that this shows what a great writer Madeleine L’Engle is that she could make all this weird dialogue fit together and sound natural. As a writer I know that I would sound incredibly cheesy. Some people who read these books when they were younger and then revisit it find that its not as good as they remember it to be. They notice flaw like like limited character development and not a lack of world building. I think this book is just as great as it used to be and that those people are focusing to much on the smaller details. Those aspects don’t hinder the book, in a way they enhance it. Your imagination is forced to create the rest of the details and make the journey more enjoyable.